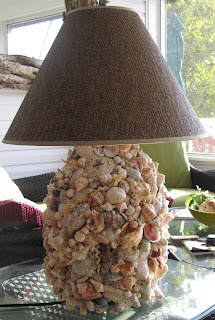 I finished my latest craft project, a shell lamp. 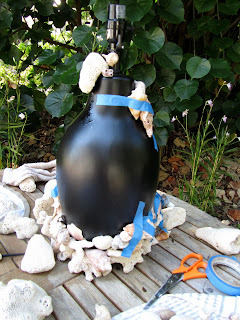 If you have ever had the desire to make a shell lamp here is the" how to". You will need to be in a well ventilated area. The E6000 glue is a bit strong smelling. I prefer E6000 glue because the bond is permanent after 24 hours. With E6000 you have a few minutes in which you can move a shell if you change your mind on the placement that you want. Start with your coral and or heavy, large shells. 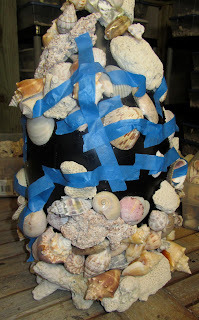 have a few shells on your lamp place some painter's tape around them to hold them in place. While the glue is setting on the bottom of your lamp you can start gluing smaller shells on the top of your lamp. When you have a few shells in place use your painter's tape to hold these shells in place. When the glue is dry carefully remove the tape. 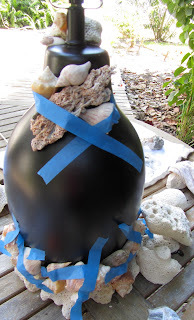 Continue gluing and taping all the way around and up and down your lamp. Sorry, this lamp takes several days to make but it is worth the time. 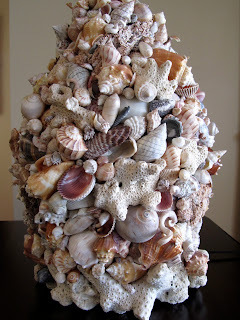 Once your lamp is full of shells you will need to start placing smaller shells in the spaces. We don't want any of the original lamp to show through. Take your time, this is the fun part. 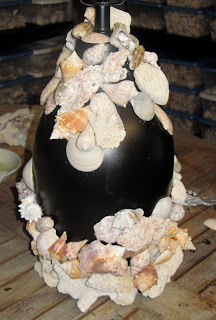 You can place your special shells in the perfect place. 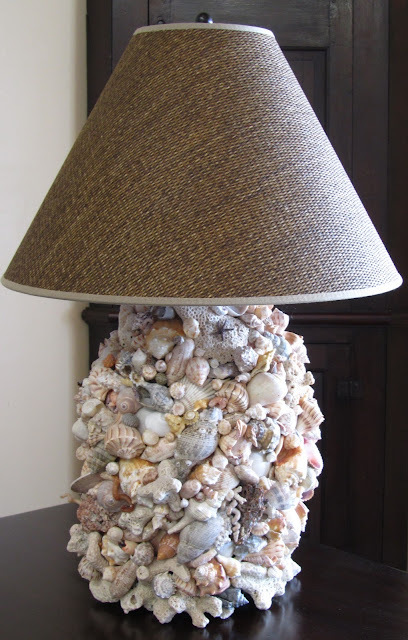 When my lamp is full of shells and there is no lamp base showing through, I like to put a few fun things onto my lamp. Here you can see a starfish. If you look real close you can see a small crab. The shell lamp is finished all I need is a lamp shade. I hope you find this project enjoyable. 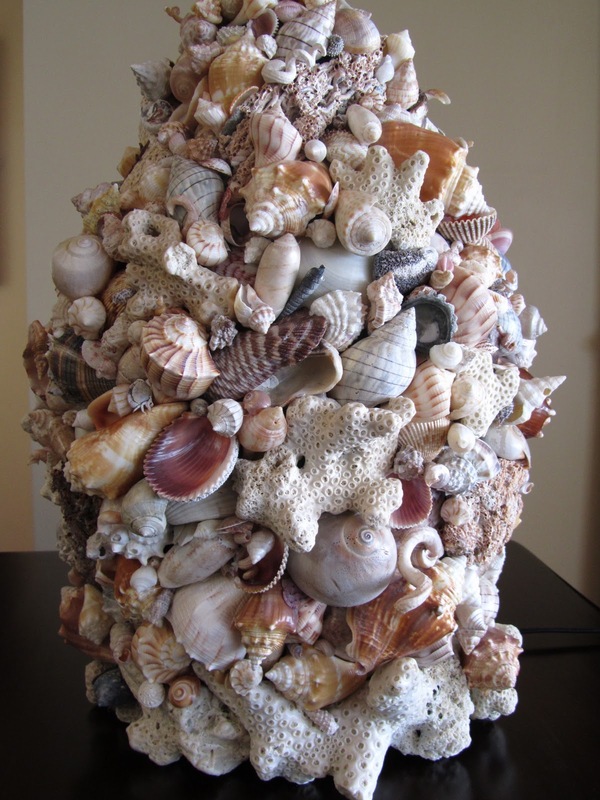 The trick is to just take your time and enjoy seeing all your shells come together to make a beautiful lamp. My shell lamp now sits happily on our back porch. I am so happy that you are going to give this a try. Have fun! They take a little time but the results are very rewarding.